Carl Fogarty and F1 Tools have joined forces to produce a new limited edition Foggy toolbox, featuring pictures of the four-times WSB champ in action. The toolbox has quick release ball bearing track slides and auto-return, lockable, lined drawers. 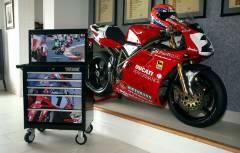 A four-drawer top box costs £279, the five-drawer roller cabinet is £599, and both boxes together cost £799. There's also a 193-piece tool set available.